Visiting the highest mountain in the world is not as difficult as you might think; you can reach the Mount Everest Base Camp by taking a tour to Tibet and even include a few of the other Tibet sites on the way. A trip to Mt Everest base camp would start by booking your Tibet tour through a professional and official tour company which will then organize your entry permit to Tibet. You can travel to Lhasa, Tibet by air or by train where you'll be met by your tour guide. Start by resting the night in your Lhasa hotel before setting off on the tour. Depending on the length of the Tibet tour you have chosen you can include sites like the Potala Palace, Jokhang Temple, Sera Monastery or Yamdrok Lake. After visiting some of the amazing sites in and around Lhasa like the Potala Palace, Jokhang Temple, the colorful Barkhor Street and the Sera Monastery your tour will head off towards Mt. Everest. The journey begins by motorized transport along rural roads through stunning scenery. You can see wild grasslands, some of the highest snow covered mountain peaks and magical lakes. The tour group passes by the turquoise Yamdro-tso Lake, Karo-la Glacier and on to Tibet's second biggest city, Shigatse. At the Kubum Monastery you will see a 35 meter high decorated stupa with a gold dome and you can explore the rooms of the monastery. Your overnight stays will be in guesthouses or tent guesthouses and you can meet locals and learn about their traditions and culture. Before moving on to the base camp you will get to visit another stunning monastery, Tashilunpo Monastery. The last stop before reaching Mount Everest is Rongbuk Monastery at 4,980 meters above sea level. The highlight of the tour is of course when you reach the Mount Everest Base Camp. 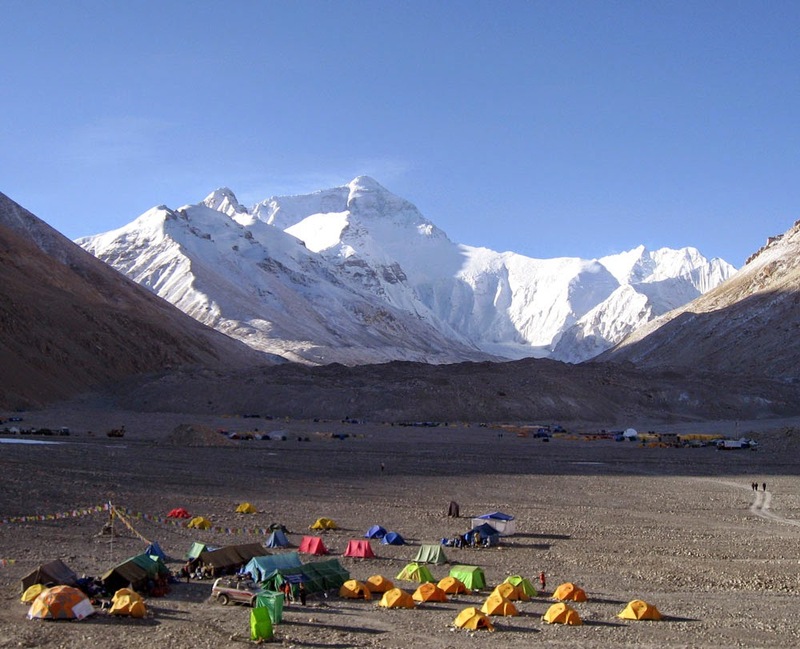 There are two Everest base camps, one on the Nepal side (south base camp) and the other in Tibet (north Base Camp). The north base camp is 5,150 meters above sea level and is established as a rudimentary camp for mountain climbers and tourists to rest up, get their equipment in order and prepare before climbing further up the mount. It is also a necessary stop for climbers to get acclimatized to avoid later altitude sickness. Mt. Everest Base Camp tours travel by motorized transport part of the way and then you can choose to hike or take an animal carriage to cover the last 1.5 to 2 hours of the journey. On the return journey the tours return to Tingri via the Friendship Highway and then back to Shigaste. From there you will be taken by private vehicle to the airport for your return flight. Of course this is just one of the possible tour itineraries; there are others which include many other sites in Tibet. There are multiple tour options for visiting the Mount Everest Base Camp you can choose from a 5, 6, 7, 8, 11 or 10 day trip and you may wish to start your journey from Nepal or from China. There is even a Mount Everest Base Camp tour specifically tailored for seniors!